Attained 369.7 mph in his Railton in 1939. John Rhodes Cobb (December 2, 1899 – September 29, 1952) was a British racing motorist. 1899 December 2nd. Born and lived in Esher, Surrey, near the Brooklands race track. He made money as a director of fur brokers Anning, Chadwick and Kiver and could afford to specialise in large capacity motor-racing. He held the ultimate lap record at the Brooklands track driving the 24 litre Napier-Railton at an average speed of 143.44 mph achieved on 7 October 1935, regaining it from his friend Oliver Bertram. 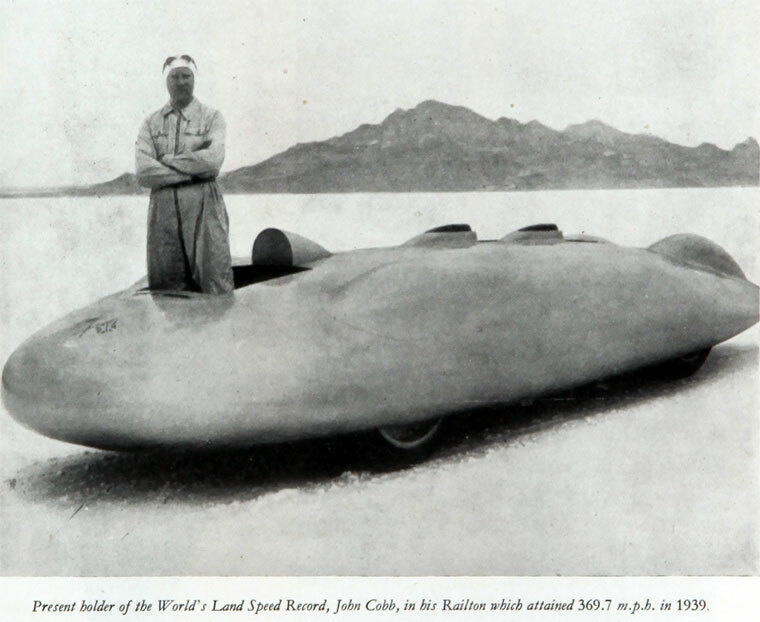 Driving the piston engined, wheel driven Railton Special he broke the Land Speed Record at Bonneville on August 23, 1939 at a speed of 367.91 mph. Without this being beaten he raised the record to 394.19 mph in 1947. The record was unbeaten until 1963 when it was narrowly surpassed by Craig Breedlove in the jet powered Spirit of America. During World War II he served as a pilot in the Royal Air Force and between 1943 and 1945 in the Air Transport Auxiliary. He reached the rank of Group Captain. He died attempting to improve the water speed record at Loch Ness in the jet speedboat Crusader at a speed in excess of 200 mph . There is a memorial to him erected by the people of Glenurquhart. He is buried at Christ Church, Esher. John Cobb married twice, first to Elizabeth Mitchell-Smith in 1947. After her death in 1948 he married Vera Victoria Henderson (1917-2007) in 1950.